At this stage we evaluate your lawn and present you with a logical plan and pricing information. This will enable you to choose the best package to suit your aspirations, lawn, needs and budget. Knowing the type of soil and conditions will help us determine your lawn’s needs and tailor a treatment package that is right for you and your lawn. We don't offer confusing packages, and we understand everyone has a different budget for lawn care. that's why we offer our 5 treatment plan as standard and extra services only if your lawn needs or would benefit from them. We use professional turf fertilsers to nourish your lawn. These feeds are not available domestically and are designed to release nutrients to the root zone over a number of weeks. Our qualified team will control weeds and moss by applying the right products, at the right time and in the right way. We call at your home around every 10 weeks to carry out the treatment cycle, starting with the current season. We will notify you in advance of each treatment date. We offer a full range of additional services so we can make sure that your lawn reaches and stays at its full potential. 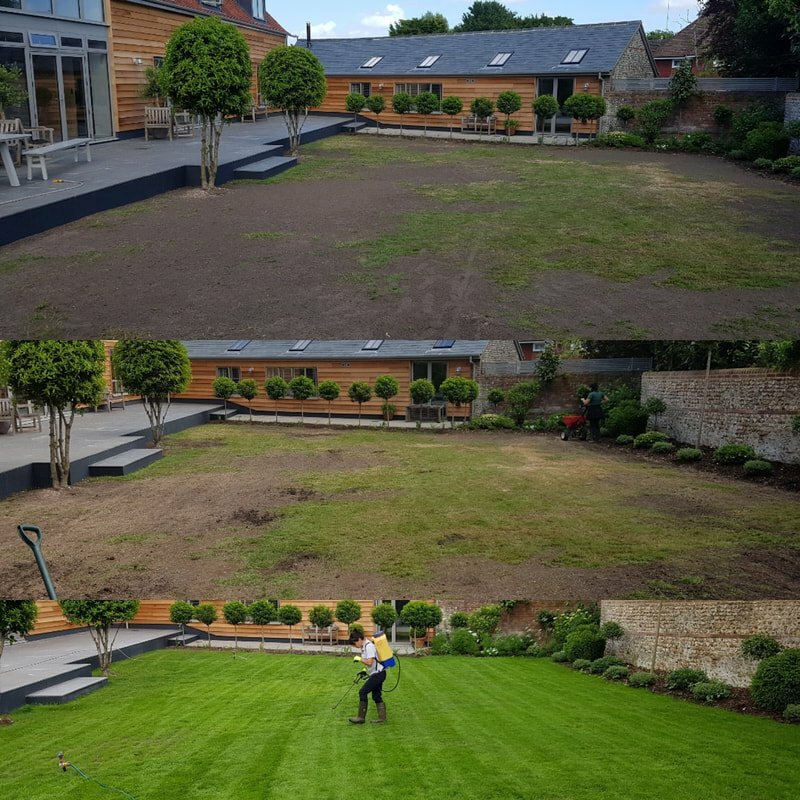 Here's a lawn renovation we completed in June 2017, the bottom picture was taken 18 days after the work. 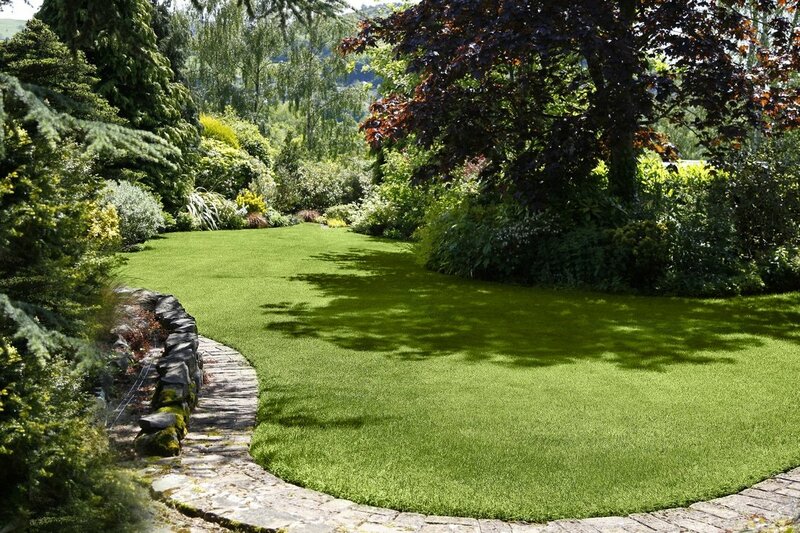 ​Amazingly green lawns for surprisingly little. Our "Essentials Plan" has all you need, specialist professional service from people who are serious about lawns. 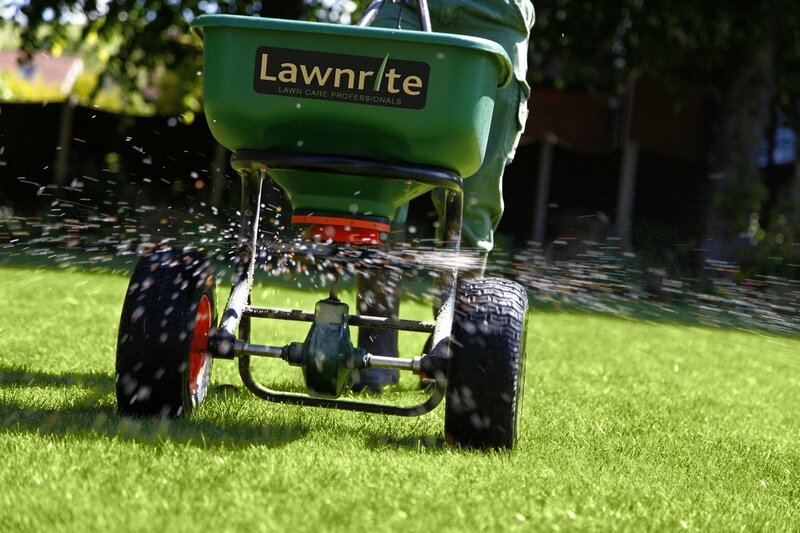 Lawnrite apply "Advanced Technology" granular fertiliser to replace the nutrients lost from regular cutting to develop a strong and healthy green lawn. The lawn will again be treated with a selective weed killer as needed. As temperatures cool we reduce the amount of Nitrogen in the feed which will either be a liquid or granular application to manage growth as we turn our attention to the root of the plant providing key nutrients to maintain the lush green look into winter. Selective weed and moss control if needed. The emphasis is on plant health and moss control. Due to optimum growing conditions for moss through the milder and wetter winters of late, moss is becoming more and more of a problem in the domestic lawn. This treatment will also strengthen the sward against disease and maintain a deep green colour. Our Greener Lawns programme will help the majority of lawns meet their potential but some may need a little extra help. We will recommend additional treatments such as aeration, scarification, soil conditioning or over seeding only if they are required, we are able to complete one off treatments and tailor plans to your needs. In Spring and Autumn w​e apply a specialist organic-mineral fertiliser that is high in potassium and contains composting bacteria to break down moss and organic matter (thatch) into nutrient whilst feeding the turf. A low rate of organic nitrogen ensures that we don’t over-stimulate grass whilst delivering a steady feed for an extended period. The feed acts as a "moss inhibitor" specific nutrients are included to provide an intense green colour. The combined effect of the feed and bacterial action is to control moss and thatch levels without raking and a reducing the need to scarify. Optional Treatments - "one off" treatments available. 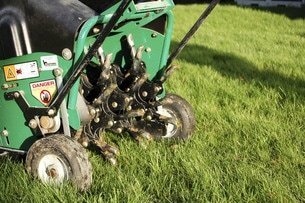 Aeration is a process where we use a professional machine to remove thousands of cores from the lawn which allows better movement of air and water in the root zone. A well-aerated lawn will cope better in periods of drought and will reduce the likelihood of waterlogging. Heavier clay soil profiles, or areas that experience most wear and traffic are prone to compaction and will benefit most from regular aeration. We rake up the cores or leave them depending on your preference. ​We are happy to complete "one off" aerations. Scarification is a process where we use a professional machine to remove thatch and moss that has built up. The process is designed to help the grass by allowing nutrients and oxygen access to the soil layers resulting in a healthier more drought resistant lawn It also creates good conditions to lay seed and for its germination. Removing the thatch layers also helps to discourage disease. 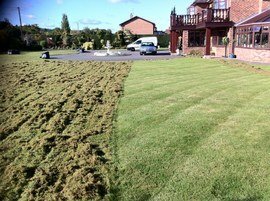 This process is undertaken in Spring or Autumn so the lawn has time to recover from the process while conditions are favourable. Chcek out our "Ultimate Moss Control" plan if you woudl like a less intensive solution. We are happy to complete "one off" scarifications"
Whilst prevention is better then cure and good lawn care practices can help prevent fungus disease's they can still occur on the best maintained lawns. Keep an eye out for typical diseases like Red Thread, Fusarium Patch and Rust. Look for changes in the lawn, patches developing and seeming to spread. Its better to take action quickly and we would rather take a look and find no disease then be called out when the only solution is to apply a fungicide and / repair any damaged areas. We are able to apply a product that has both a preventatative and currative effect on common lawn disease. 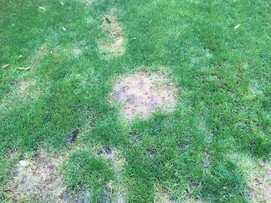 Find out more about lawn diseases on our "Pests and Diseases" page. Whether its worm castes on the lawn, Chafer Grubs or Leatherjackets eating at the roots of the grass or birds and badgers digging down to get at the grubs we are here to help - check out more on "Lawn Pest & Diseases" on the seperate page on this website. We are able to apply a professional wetting agent which is designed to help with the management of water in lawns. It helps solve the two main water related problems facing the domestic and commercial lawns today - the lack and cost of suitable irrigation water and Dry Patch. The treatment helps water get to where it needs to be deep into the root zone – because it works so efficiently the amount of irrigation needed is reduced and the plant is better able to cope with dry periods. Please note that this treatment is not a substitute for watering the lawn. Lawnrite is owned and run independently, not part of a large Franchise! 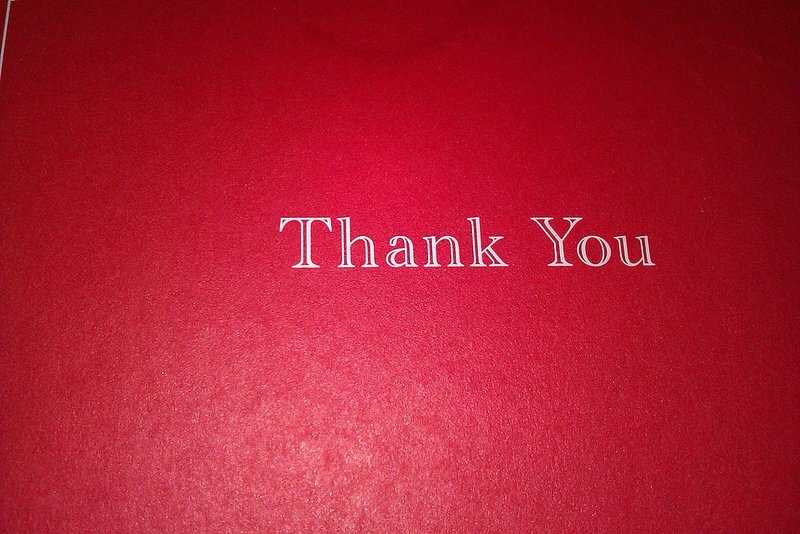 Meaning we can offer a much more personal service. We only deal with lawns so you know that you will be getting a very specialized service. We are licensed and insured to carry our all the treatments we offer. 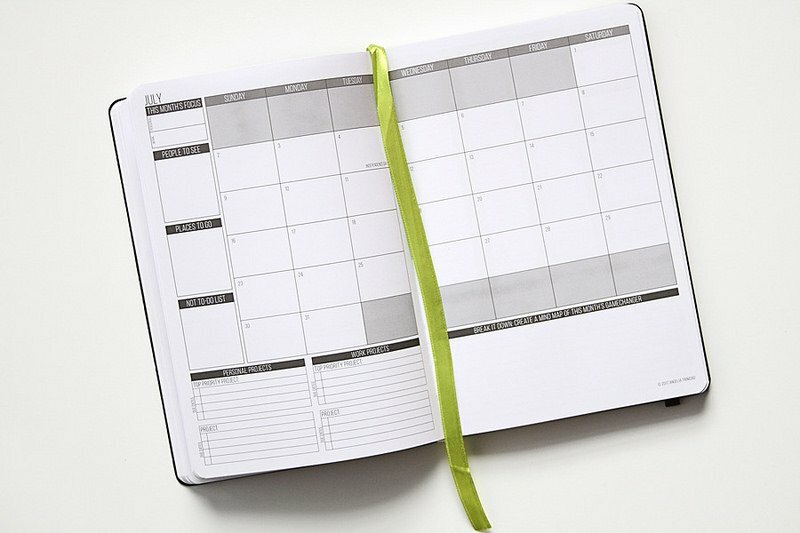 We will always let you know when your next treatment is due and remind you nearer the time. If you ever need advice or have a concern about your lawn just get in touch and we will pop round .